Cowtown Services will be held Sunday, June 2, 2019, at 8:00 am & 9:00 am at Cowtown. 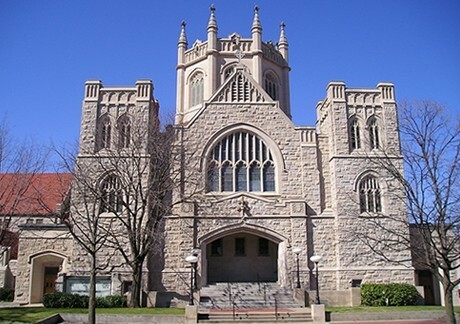 We will worship in the white frame church which was the second place of worship for the congregation of First Presbyterian Church. The 10:45 am church service will be held in the sanctuary with communion being served. There will be no chapel service. No communion will be served at Cowtown. On April 24th at 5:30 p.m. we will gather at Minisa Park to celebrate Earth Day with activities, food, and ice cream. We will also have on display information about how you might be a good steward of the earth’s precious resources. So, bring a side and tableware and we will provide the hot dogs, macronni and cheese, and ice cream. Join us for Summer Worship at 9:30 AM in the Sanctuary. Coffee Fellowship in the Well before and after worship. Truly, summer is a great time to adjust to a new rythym in the life of the Church once Pentecost has come and gone. Those who normally attend the 8:30 AM service in the Chapel and 10:45 AM service in the Sanctuary get to attend the 9:30 AM service in the Sanctuary. Long time members get reintroduced as new friendships are made and strengthened. According to the liturgical calendar, we are in Ordinary Time which is anything but ordinary when you consider that the church has been sent in the power of the Spirit to proclaim and embody the Good News of Jesus Christ. Thus, it should come as no surprise that summer is a great time to send our Youth on mission trips. 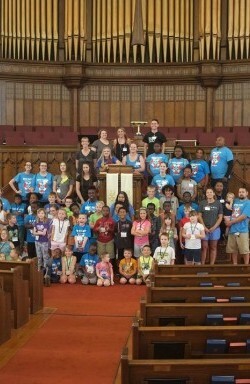 Our children will be engaged in VBS and Games Camp. Our Camp (Whispering Winds) will be busy receiving groups when the pool opens. Please join us for any or all of the Summer activities found on this website. Find your place in a group designed specifically for you. We have something for everyone. Experience the true magnificence of God’s love through music. We have many activites for all ages. Join us for Palm Sunday on April 14 to celebrate Jesus' entry into Jersalem. Children will be waiving Palm branches and shouting for joy as we say "Blessed is he who comes in the name of the Lord. Join us at 7:00 p.m. as we remember Jesus' last meal with his disciples and read the Passion narrative from Luke as the candles are extinguished. The Choir will be singing a piece from Rene Clausen entitled Kyrie. Join us at 11:45 a.m. in the West Dining room for lunch and then to the Chapel at 12:30 p.m. for a Good Friday service. A one hour prayer vigil will follow. Celebrate with us at the 10:45 a.m. service in the sanctuary the Resurrection of Jesus Christ in Word and Song. Choir with orchestration will be performing pieces Handel's Messiah. Easter egg hunt to follow on church lawn.